Animal welfare and rights in Japan is about the laws concerning and treatment of animals in Japan. Japan has had a national animal welfare law since 1973, but its protections for animals are weak by international standards. Animal activism in Japan is focused on the welfare of companion animals. Japan's main animal welfare law is the 1973 Act on Welfare and Management of Animals. The law makes it a crime to kill, injure, or inflict cruelty on animals without due cause, and creates a duty of care in owners and keepers of animals to maintain their health and safety and raise them in a manner according to their species and behavior. The law lists cattle, horses, pigs, sheep, goats, dogs, cats, domestic rabbits, chickens, domestic pigeons and domestic ducks, or other animals which have an owner and are mammals, birds or reptiles as protected, meaning that fish are not protected. The penalty for killing or injuring an animal in this category is a fine or imprisonment up to one year; abandonment and cruelty by neglect are punishable with fines. 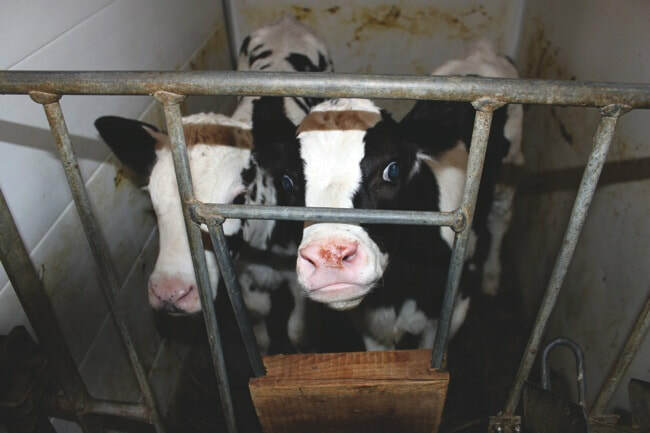 Farm animals besides fish are protected by the anti-cruelty and duty of care provisions. Slaughter is to minimize pain and distress (though appropriate methods are not specified and stunning is not required). There is no legislation specifically addressing farm animals, and livestock are excluded from the law's Regulations on Animal Handling Businesses. The anti-cruelty and duty of care provisions also apply to animals in research (except fish). In addition, the law stipulates that alternative methods and the reduction of the number of animals used be considered, and methods that minimize pain and distress be used as much as possible. Animals used in experiments should be killed in such a way that minimizes pain and distress. The law was amended in 2005 to crate new basic guidelines for experimentation based on the Three Rs (refine, replace, reduce) for animal testing; the law still relies heavily on self-regulation, however. In 2012, the law was amended to impose stricter regulations on sellers of dogs and cats; create measures for animal welfare during disaster; more clearly define animal abuse; and expand duty of care, stating that "every person shall maintain the environment and health of animals, shall feed and water animals properly by taking into account their natural habits and giving consideration to the symbiosis between humans and animals." In 2014, Japan received a D out of possible grades A, B, C, D, E, F, G on World Animal Protection's Animal Protection Index. Veal crates, gestation crates, and battery cages are legal in Japan, as is cutting off tails, beaks, and fangs without anesthesia. Cow production increased from 142,000 tons in 1960 to a peak of 602,000 in 1994, down to 490,000 tons in 2015. Poultry consumption rose from 74,000 tons to 1.375 million in 2015, an increase of nearly twenty-fold. In 2015 Japan had 1.185 million farmed cattle, and 17.15 million farmed swine. 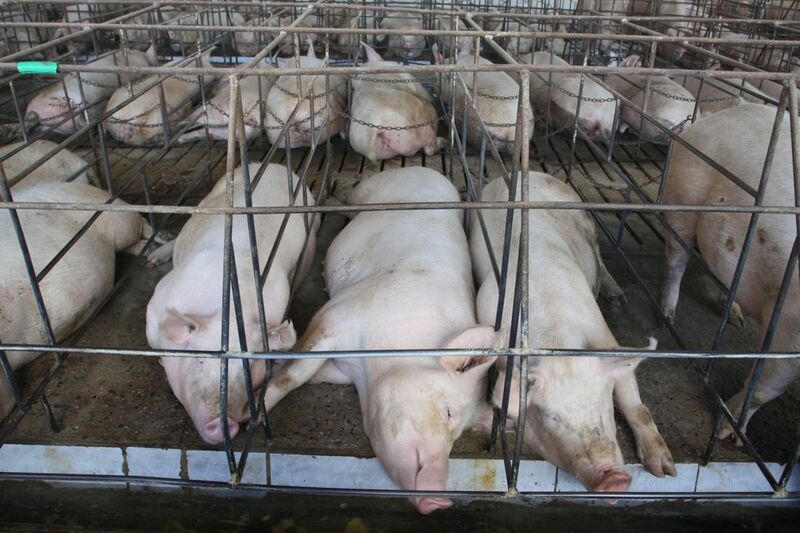 Over 823 million farm animals were slaughtered in Japan in 2010. Between the 1960s and 2000, Japanese total meat consumption increased fivefold. Japan is the second-largest fish and seafood importer in the world, and the largest in Asia. However per capita consumption of fish and seafood declined from 40 kg in 2007 to 33 kg in 2012, partly due to a rise in meat and dairy consumption. In a 2014 survey by the Japanese organization Animal Rights Center, 4.7% of respondents were vegetarians (including vegans). A 2009 survey found a total of 11,337,334 animals being maintained in Japanese laboratories. Cruelty Free International estimates that Japan ranks second in the world (behind the United States) in the number of animals used in experiments. Testing cosmetics on animals is legal in Japan; in fact, law requires that "quasi-drugs" like skin-lightening products, suntan lotion, and hair growth tonics be tested on animals when new ingredients are added. Shiseido, Japan's largest cosmetics manufacturer, announced in 2013 that it would stop testing cosmetics on animals. In 2015, Humane Society International began leading a Be Cruelty-Free campaign to pressure the National Diet to ban testing cosmetics on animals. Taiji dolphin drive hunt - The Taiji dolphin drive hunt is a dolphin drive hunt that takes place in Taiji, Wakayama in Japan every year from September to March. The hunting is done by a select group of fishermen. When a pod of dolphins has been spotted, fishing boats move into position. One end of a steel pipe is lowered into the water, and the fisherman aboard the boats strike the pipe with mallets. This is done at strategic points around the pod, in an effort to herd them toward land. The clamor disrupts the dolphin's sonar throwing off their navigation and herds them towards the bay which leads to a sheltered cove. There, the fishermen quickly close off the area with nets to prevent the dolphin's escape. As the dolphins are initially quite agitated, they are left to calm down over night. 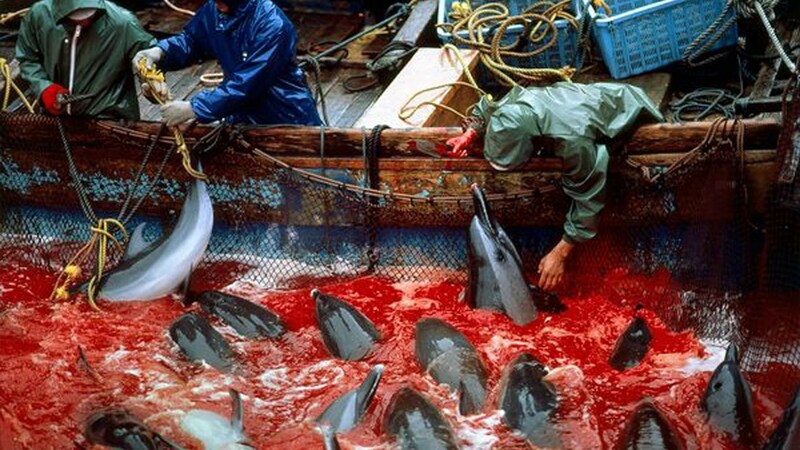 The following day, fishermen enter the bay in small boats, and the dolphins are caught one at a time and killed. The primary method of dispatch was for a long time to cut the dolphin's throat, severing blood vessels, and death was due to exsanguination. Ikizukuri (生き作り), also known as ikezukuri (活け造り), (roughly translated as "prepared alive" is the preparing of sashimi (raw fish) from live seafood. In this Japanese culinary technique, the most popular sea animal used is fish, but octopus, shrimp, and lobster may also be used. The practice is controversial owing to concerns about the animal's suffering, as it is still alive when served. The restaurant may have one or several tanks of live sea animals for a customer to choose from. There are different styles in which a chef may serve the dish but the most common way is to serve it on a plate with the filleted meat assembled on top of the body. Japanese whaling, in terms of active hunting of these large mammals, is estimated by the Japan Whaling Association to have begun around the 12th century. However, Japanese whaling on an industrial scale began around the 1890s when Japan began to participate in the modern whaling industry, at that time an industry in which many countries participated. Japanese whaling activities have historically extended far outside Japanese territorial waters, even into whale sanctuaries protected by other countries. During the 20th century, Japan was heavily involved in commercial whaling. This continued until the International Whaling Commission (IWC) moratorium on commercial whaling went into effect in 1986. Japan continued to hunt whales using the scientific research provision in the agreement, and Japanese whaling is currently conducted by the Institute of Cetacean Research. This was allowed under IWC rules, although most IWC members oppose it. However, in March 2014 the UN's International Court of Justice ruled that the Japanese whaling program, called "JARPA II", in the Southern Ocean, including inside the Australian Whale Sanctuary, was not in accordance with the International Convention for the Regulation of Whaling, and was not for scientific purposes, as it had claimed. They ordered Japan to cease operations. Despite the court order, Prime Minister Abe quickly called for the resumption of whaling operations. In December 2015, Japan went ahead with their whaling program, renamed "NEWREP-A". On January 15, 2017, a helicopter in the Australian Whale Sanctuary photographed the Japanese whaling vessel Nisshin Maru with a freshly-killed minke whale on its deck. Crew members quickly covered the carcass after seeing the helicopter. Their objective is to hunt 3,000 Antarctic minke whales over 10 years, starting with 330 whales during the 2015–16 season. Antarctic minke whale have experienced an apparent decline in population, though the International Union for Conservation of Nature (IUCN) indicates that it lacks sufficient data to confer a "threatened" designation on the species of minke whale. The infamous clip of a bear cub being tormented for amusement on Korean TV network SBS’s “Animal Farm” was shown on Fuji TV, so that a studio audience of Japanese celebrities could laugh at the animal writhing in mortal fear. There are a few expressions of pity for the bear, but it’s mostly laughs from the audience. The bear’s experience is presented as an opportunity for him to “learn” how to be strong. At the end of the clip, we can see the results of one month of “training”: the bear is now able to torment the monkey that it once feared.